A bold, frank and moving anthology by top LGBTQ+ authors: a book to stir every emotion. Stories and poems by authors including Steve Antony, Fatti Burke, David Levithan and Alice Oseman, each with an inspiring illustration. A rainbow in book form. What is Pride? Now that it’s a truly global event (among other things), it’s a great moment to take stock and get a fresh viewpoint on what Pride stands for today. 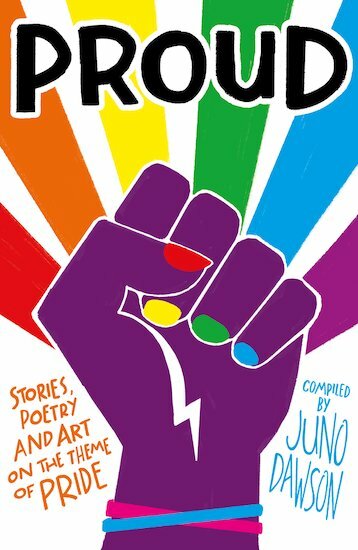 This fantastic compilation of LGBTQ+ writing is compiled by Juno Dawson, who wrote This Book is Gay and Clean. It’s a celebration. It’s a series of questions. It’s a look at how far we’ve come. And, above all, it’s a statement of pride. Contributors: Steve Antony, Dean Atta, Kate Alizadeh, Fox Benwell, Alex Bertie, Caroline Bird, Fatti Burke, Tanya Byrne, Moira Fowley-Doyle, Frank Duffy, Simon James Green, Leo Greenfield, Saffa Khan, Karen Lawler, David Levithan, Priyanka Meenakshi, Alice Oseman, Michael Lee Richardson, David Roberts, Cynthia So, Kay Staples, Jessica Vallance, Kristen Van Dam and Kameron White.